Well, I got lucky and manged to buy this centre channel directly from Innersound when it was liquidating in 2006. I believe only two were ever built. Roger Sanders recently restored it for me and it’s a gem. It is everything you might imagine if you know what Innersound/Sanders speaker are capable of. Detail, dynamics and outrageous realism are what I hear. I use it every day. And it never stops thrilling me at the heart of my Kaya front pair and the Kachina rear channels. State of the art multichannel sound to this day. 11 out of 10. 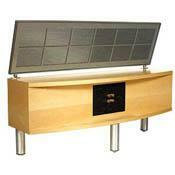 Being a true electrostatic speaker, off-axis listening is not possible. You must be facing it directly to hear it properly.